STEM – you have probably noticed this acronym in advertisements, newsletters and handouts about the current school curriculum and your child’s education. What is the fuss about? Why are educators and other parents so preoccupied by STEM? STEM (science, technology, engineering and mathematics) is the focus of a growing movement to boost the profile of these fields and concepts both inside and outside of the classroom. Enthusiasm for STEM reflects the changing employment landscape as well as numerous studies that have linked STEM skills to improvements in lateral thinking, scientific understanding and even an increase in the development of interpersonal skills in young minds. For those still struggling to get around what STEM concepts are, why they are important and how to help your children improve their STEM skills – here are five things to understand. Whether you child enjoys drawing, reading, writing or building and numbers – STEM concepts are everywhere and they are important! It may appear strange to consider engineering as related to artistic learning, yet STEM skills promote critical thinking, spacial reasoning and innovation that are also fundamental to creative pursuits. STEM is all about identifying problems and discovering new ways to resolve them. Encourage your children to think critically about any issue – it could be something as common as their phone – what are some of the limitations of this technology? How could it be improved to help people in the future? Maybe some time down the line your child will be part of a team that develops a technological solution that changes the world! 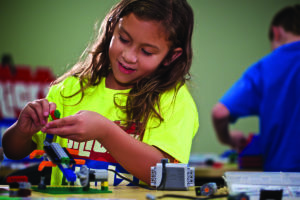 Children often learn best when they are discovering things in the real world rather than simply via screen-based activities or through abstract concepts.Fun activities, including playing with LEGO Bricks, encourage children to use their hands and their minds – enabling abstract mathematical and engineering concepts to come to life. Studies reveal group learning is highly effective when it comes to mastering STEM concepts. From working collectively on a class project to taking part in a robotics class or playing a team sport, working in a group promotes understanding and builds problem-solving skills. Women are consistently under-represented in STEM related industries. In fact, by the time girls reach their high school years many will already display a decreased interest in science and mathematics. Being aware of this phenomenon can help you, as a parent, give your daughter the extra encouragement she needs to explore STEM related topics and skills – from architecture and design to physics and computer coding.